Super Kickers youth soccer program consists of 5 seasons throughout the year: Fall, Winter, Mid-Winter, Spring, and Summer. Classes are offered every day of the week in Jackson Heights, East Elmhurst, Middle Village, Sunnyside and Astoria. They are located both indoor and outdoor, depending on the season and location. They range from 30 minutes to 1 hour and consist of a warm-up, stretches, soccer basics, soccer activities, and soccer games. Super Kickers also offers Advanced Soccer clinics, Ballet/Tap, Gymnastics, Piano Lessons, Judo and Jiu Jitsu. 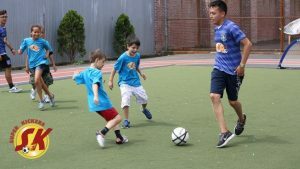 During the week there is a Fun and Fit After School Program in Jackson Heights, Astoria and Sunnyside. We also run Holiday Mini Camps, Birthday Parties and a very popular 8 weeks Summer Camp. Several locations throughout Queens.